There is an ongoing commitment to staff training within the group and we aim to make provision for staff to upgrade their training. Little Squirrels is a Community Nursery in Ryde, Isle of Wight. Our modern and purpose built nursery was constructed in late 2002 and opened in May 2003. We have developed and expanded our nursery since then to meet the needs of the local and wider community. We liaise on a regular basis with our other settings at Oakfield Pre School & Holiday Club and St George’s Nursery & Pre School to share resources and ideas. A place in our nursery is NOT dependant on entry to a particular local primary school. We welcome all children, and with the help of their parents/carers, we will liaise with whichever school is chosen and provide a dedicated, trained member of staff to assist with the transition. We are regulated by Ofsted and the IW Early Years Unit, with whose standards we must comply, we are also inspected on a regular basis. Click here to see our latest inspection reports. There is an ongoing commitment to staff training within the group and we aim to make provision for staff to upgrade their training. We close our premises for one day each summer in order to bring our staff together to attend in-house training. The aim of the Nursery is to promote a positive learning environment in a warm and friendly atmosphere. A wide range of opportunities are made available to the children in the recognised areas of development as set out in the Foundation Stage 0 – 5 years. We try to operate an ‘open door’ policy; we are always available to discuss your child’s day with you at the beginning or end of each session. If you have a concern regarding your child or if there is a change of situation that may affect your child please let us know. If you wish to see someone in private please make an appointment with us. Our daily activities are very much ‘experience based’. We include time for outside play, in each session, in our large gardens and outside activity areas. Find out more about our Special Educational Needs and Disabilities (SEND) offer. Please feel free to download our Policy Documents and Welcome Pack from this site and if you would like your child to attend Little Squirrels Community Nursery please either print off the Registration Form and Consent Forms from this site or call in to discuss your requirements with us. We are always happy to make appointments to look around the nursery and meet the staff and we can arrange ‘stay and play’ sessions, free of charge, to allow your child time to explore the nursery and feel at home before they start. Please feel free to ring us on 01983 615648 between 8.00am and 6.00pm Monday to Friday. 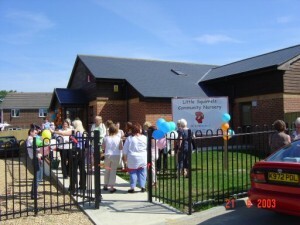 Little Squirrels Community Nursery is an independent and privately run childcare setting located on Ryde Business Park, off Great Preston Road.